Here’s the second wallpaper from the Courage Series. This was the quote and scene that inspired me to do the series and it just screamed Kurt when I read it. I stumbled upon it while looking about quotation sites (yeah I’m a nerd 😛 ) and unfortunately don’t know who the line is from (but if anyone knows let me know). NOTE: I got a HD version of the episode today so I re-did it (same images just higher resolution [although Blaine is now smiling in the Prom pic). I swear I’ll get around to that Quinn/Santana/Brittany Commission soon (Klaine just won’t leave me alone and Prom Queen smacked my Muse into gear and it won’t leave me alone). Anyways, this wallpaper is one of four in a series based around a series of courage related quotes I found perusing the web. 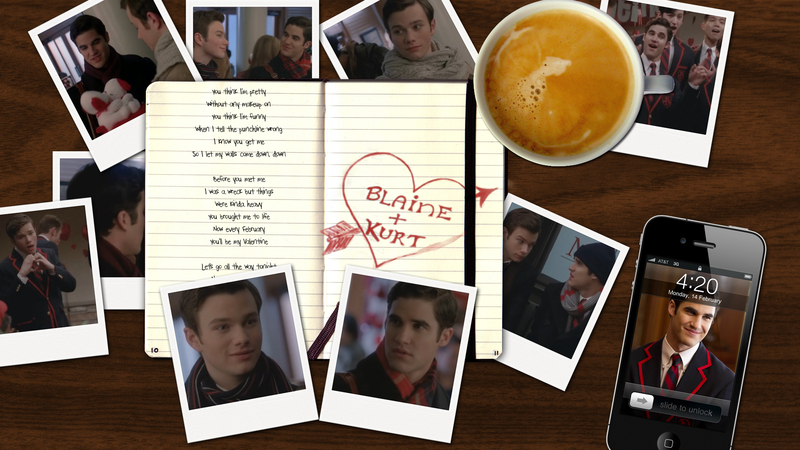 I thought it would be appropriate to feature our favorite Warbler, Blaine Anderson, for the first one. I have to say I’m really liking what RIB are doing with Blaine (despite the fail-fest that was BIOTA) particularly in Prom Queen. Even though Blaine was clearly afraid and apprehensive of going to Prom and potentially reliving a traumatic experience he really stepped up and stood by his man. Yeah, he stayed discreet in his clothing choices and hid on the sidelines during the dance but when it counted stepped up to the plate and by simply asking for a dance showed McKinley High he wasn’t afraid or ashamed of being who he was. Anyways Happy Belated Valentines everyone. Sorry for being such a bad glee fan guys but work MMO obligations (FFXIV or DCUO anyone?) have been keeping me from my photoshopping. Forget Edward and Jacob…I’m Team Tina. And thanks to soapbubbles511 from the glee forums for the RS Chris. This one took so long because I really only had one picture of them together (I finally managed to find a few more but once I started working on the actual wallpaper I found having so many pictures was WAY too busy). I might do another one with more pictures but compositionally adding more to this one would have ruined it imho. I hope she likes it. Images from Chris Colfer Online and Lea Michele web, cloud by Wordle. While browsing for Lea Michele pictures for a request I got bit by my muse and here’s the result.